UPDATE: THE BOOK IS PUBLISHED. AVAILABLE HERE. 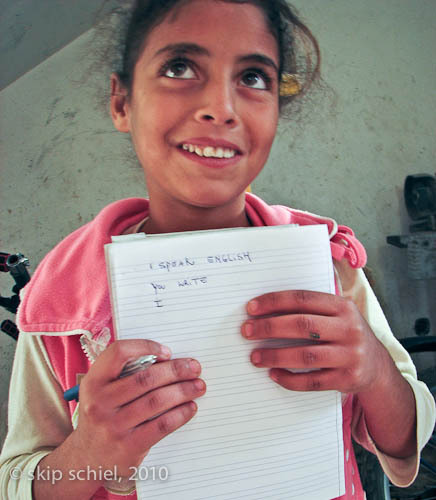 Titled Eyewitness Gaza, like our movie and my latest slide show, I will publish this book via Blurb.com. Here is a foretaste. Publication date is January 5, 2012. 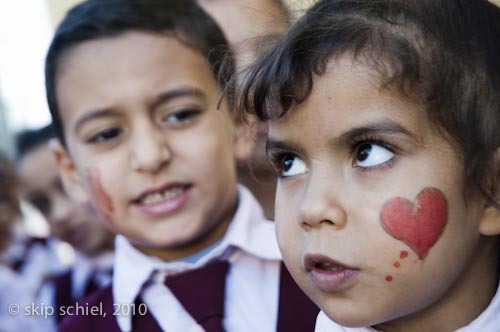 Dedicated to the youth of Gaza, infants to young adults. 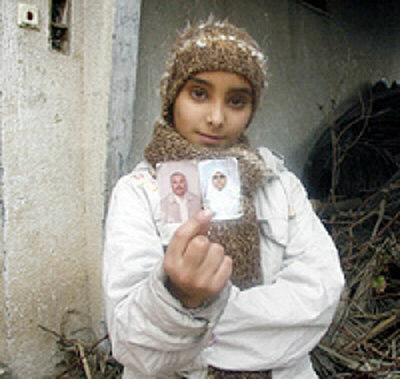 Husam may have anticipated Operation Cast Lead, the vicious Israeli assault on Gaza for 22 days which began on December 27, 2008. According to B’Tselem, The Israeli Information Center for Human Rights in the Occupied Territories, the Israeli military killed 1,389 human beings, including 248 police officers (civilians) and 320 children under the age of 16 and injured more than 5,300 more, up to two-thirds civilian. 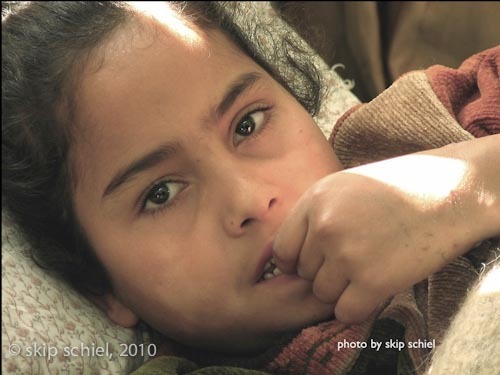 The Israelis destroyed thousands of homes, factories, and agricultural zones, rendering many homeless and jobless. Three Israeli civilians died during this period, all from rocket attacks, and ten military died, four of them by friendly fire. 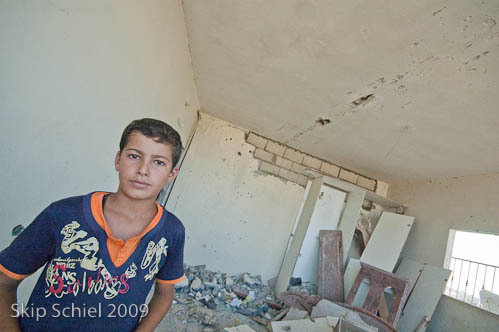 When I was last in Gaza in late 2010 more than 200 families still lived in tents. For some recent history: in 2007 Hamas militarily ousted its main political rival Fatah and gained full control of the Strip. In 2006 Hamas won an open, free, fair, well-monitored Palestine-wide legislative election, trouncing Fatah. In response, Israel and many other governments, including the United States, began a siege lasting to this day. And in 2010 Israel loosened the siege very slightly after the Mavi Marmara incident when Israel attacked an international humanitarian aid convoy and killed seven Turkish civilians. Any accountability here? Any complaints from the US or other governmental supporters of Israel? Barely. However, the rise of the international court system offers good prospects. The UN Human Rights Council commissioned an investigation into Operation Cast Lead, the so-called Goldstone Report, which in fact was co-written by three other people. Despite retraction by the lead author, the eminent South African jurist, Richard Goldstone, of portions of the report which claimed Israel deliberately targeted civilians, the other authors and Human Rights Watch and Amnesty International corroborated the findings. My experience on the ground—five visits since 2004—inspires me. I have noticed much sumud (steadfastness), better use of media, the rise of the youth movement which is coincident with the Arab Spring, and expanded international awareness. The Boycott, Divest, and Sanction Movement confirms my hope of eventual resolution. My message is to show as much love as you can to your parents, because I lost my parents and I am not able to care for them anymore. I began this multi-year photo project after I’d grown successively and painfully aware of the conflicts in Palestine/Israel. 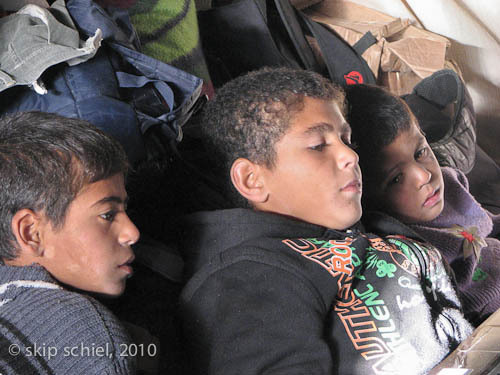 My first trip with a delegation in 2003 confirmed my decision to photograph with an open heart the situation and struggles for justice, peace, and security in the Levant. Growing up Catholic seeded my desire to travel to the Holy Land and “walk in the footsteps of Jesus.” My work in South Africa during the final phase of apartheid illustrated the many parallels between apartheid there and injustice in the Levant. My escalating awareness stirred me to take some sort of action to at least quell my outrage. And that first trip brought me face to face with the Mediterranean light which continues to challenge me as an artist and human being. Also, personal connections with so many Palestinians and Israelis working for justice with peace—risking their lives—encourage me to continue. The situation is both complex in how we tell the story and parade the justifications and yet simple on the level of injustice, impunity, the violation of international law, and the denial of basic human rights. I hope at the very least to open a few windows and doors for others who may seek comprehension and action. I am able to enter Gaza because I volunteer with the American Friends Service Committee. 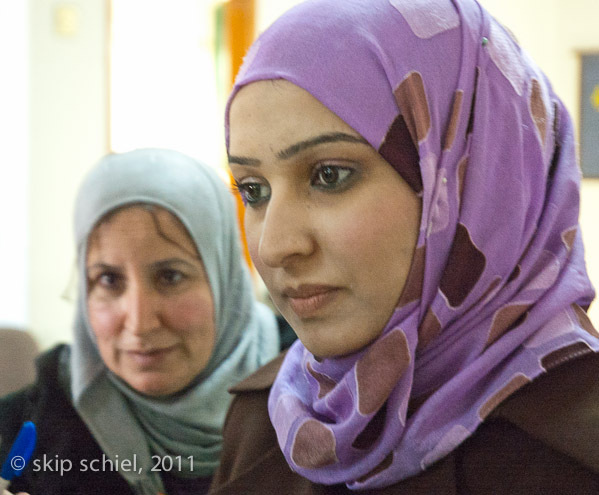 I teach photography to young adults thru the AFSC’s exemplary Quaker Palestine Youth Program. I photograph their operations—much else as well, often volunteering my photographic skills to other Gazan (and Israeli and West Bank) organizations. 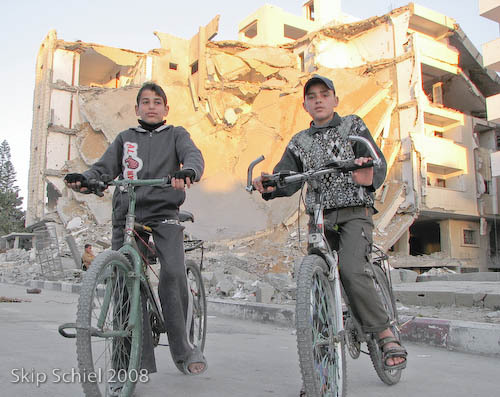 During Operation Cast Lead I learned about the brutal assault on the extended Samouni family and neighborhood in the Zeitoun section of Gaza City. The Israeli military rounded up one group and forced them into one building which the military pledged would be safe. Then the army wantonly and without warning attacked that building. In this single incident, early thirty people died. A total of forty-eight people were killed and twenty-seven homes, a mosque and a number of farms were destroyed. To my eyes, this was a clear massacre. I was horrified and never expected to meet the survivors. Thanks to the International Solidarity Movement who had raised money to buy winter clothing for the children, I accompanied the volunteers and was able to meet, interview, and photograph this extraordinary extended family. Fatah and Hamas are political rivals, splintering the Palestinian freedom movement. Fatah rules in the West Bank, Hamas in Gaza, and altho they signed a reconciliation document in early 2011, nothing tangible has changed. During the inter-factional violence of 2007 my dear friend and AFSC staff member, Ibrahem Shatali, was injured while he and others tried to stop the fighting. 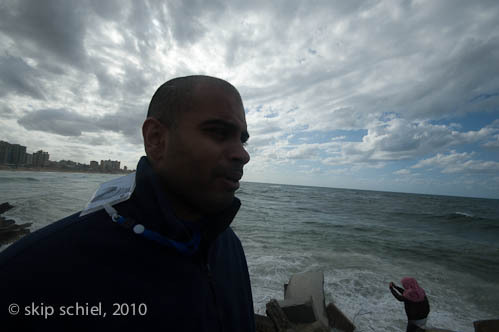 For the movie, also titled Eyewitness Gaza, I interviewed him at the shooting site. Sderot is an Israeli town of nearly 30,000 citizens less than one mile from Gaza. Thus it suffers the brunt of rocket and mortar attacks from Gazan militants. Israel uses the rocket attacks to justify the continuing siege and violence against Gaza, a ploy that might mask deeper intentions—forced removal. Yet the trauma is real, in Sderot and most of Israel. On a different scale than in Palestine but pivotal in many Israeli lives. I wanted to visit Sderot to experience and understand the trauma, share its story, and support Sderot residents who challenge Israeli policies when they cause more suffering to all parties and do not resolve the crisis. Possibly among the most useful services I’ve provided in Gaza are the photo exhibits I help coordinate with my workshop students. They are highly motivated and do excellent work, learn how to depict what they face to a wider world, and experience achievement when they mount their exhibitions in Gaza. One of my hopes is to bring their photos to an international audience. Amal Sabawi, Ibrahem Shatali, Mosab Abu Dagga, Adham Khalil, Islam Modhoun, Kanaan Samouni, Raghda El Jedali, Quaker Palestine Youth Program in Gaza, Patricia Sellick, Tom Jackson, American Friends Service Committee, Friends Meeting at Cambridge, Ken Barney, Josephine Schiele, Maria Termini, Katy Downey, Salem Quarter Quaker Funds, my support committee, & many others. Congratulations Skip! When and where can I buy it? 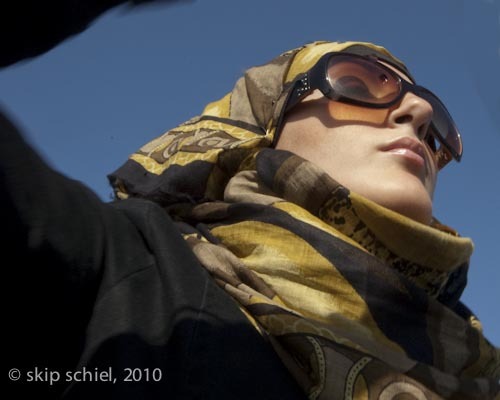 it will be available for around 35 bucks sometime in january 2012, inshallah. from blurb.com. later i’ll send more detailed info. thanks so much kathy for your quick interest. of course….and I’d like it authographed!